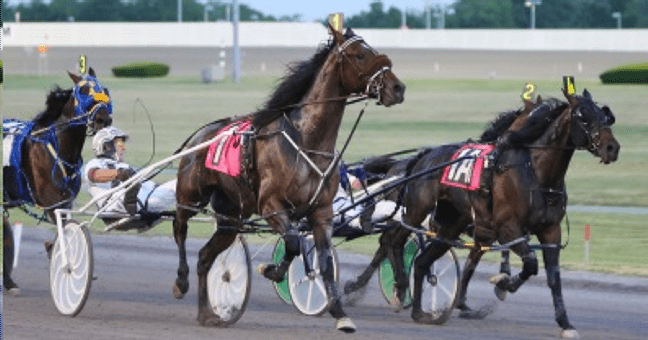 YONKERS, NY – In The Arsenal and Betting Exchange went postward as a coupled entry in the $300,000 Art Rooney Final for three-year-old colt pacers Saturday night at Yonkers Raceway, but what happened in the race will likely be remembered for how it ended. Bizarre. Strange. Odd. Perplexing. Any one of those would sum it up. Both had the lead at various points, and were actually in an interesting battle in the stretch. It looked as though In The Arsenal, driven by Brian Sears, would win easily, but he started to bear out and took some funny steps. But he was able to hold off Betting Exchange, driven by David Miller, to win by a head. Rock N’ Roll World placed third by a length. For In The Arsenal’s trainer Kelvin Harrison, it was a glorious win, albeit someone nervewracking. “I really can’t say what happened,” Harrison said. “Brian didn’t seem to be too concerned about it. I was worried (in the stretch drive), but Brian said the horse was well within himself. I was watching the race on the TV in the paddock and probably had the worst view. After the race, my horse cooled out good. He seemed very, very sharp after the race. Howard Taylor owns 10 percent of In The Arsenal with breeder White Birch Farm, and 50 percent of Betting Exchange. The two entrymates went postward at 1-4 odds in the field of eight. In The Arsenal paid $2.50 and $2.10. There was no show wagering. The exacta paid $5.70. The trifecta $18. In The Arsenal, a son of American Ideal out of the On The Road Again mare Ladyotra, collected $150,000 to raise his lifetime bankroll to more than $580,000. In The Arsenal went into the race undefeated in two starts this season, including winning his elimination race for the final. He had post position two, which gave him an easier pathway to the front. Betting Exchange, starting from post five in the field of eight, had a more difficult task. Betting Exchange led by a nose after the opening quarter mile while parked, followed by Rock N’ Roll World, while In The Arsenal was a close third. Sears made his move and led through a half in 56 and three quarters in 1:24. He had a one-length lead at the top of the stretch. Harrison said he will skip the Somebeachsomewhere Stakes this Saturday at Mohawk Racetrack and go directly into the June 13 elimination races for the $1 million North America Cup on June 20. Purrfect Bags made her season debut a winning one after three qualifiers to win the $117,724 Lismore Pace for three year-old fillies by two lengths. Driven by Victor Kirby, Purrfect Bags was fifth by 3½ lengths at the top of the stretch, but finished strongly on the outside with a final quarter in 27 2/5 to win in 1:52 3/5, beating 2-5 favorite Sassa Hanover. Purrfect Bags went postward at more than 11-1 odds. Purrfect Bags is trained by Jim King and owned by his wife, Joann Looney-King, who also trained Tyra, winner of last year’s Lismore. She’s now won more than $200,000. Purrfect Bags paid $24.60 and $5.90. There was no show wagering because of the entry of Strut My Stuff, who finished fourth, and Totally Rusty, who was fifth. Sassa Hanover paid $2.50 to place. The exacta paid $48.80.